I need to find a way to paddle while my S2 is rigged up ( with the sail, gaff and boom down ) Any ideas? We may need more information. 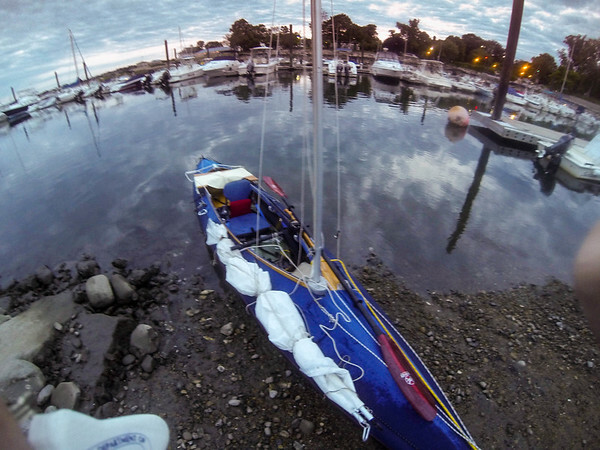 Is the mainsail with boom and yard in your way when paddling, and you want it out of the way? Are you solo and sitting in the rear seat of this double, or what? Do you want to be able to do it offshore? Is there an aka of an outrigger you could tie these to? 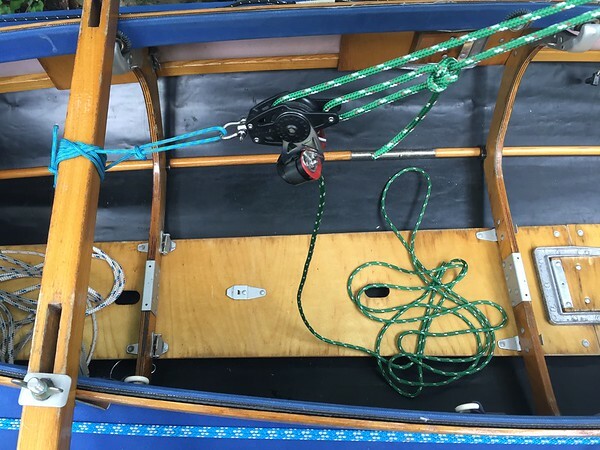 Could you tie boom and yard with sail together and use the halyard tied to the aft end of boom to lift that end sufficiently to be out of your way while the boom and yard jaws remain fitted to the bottom of the mast? 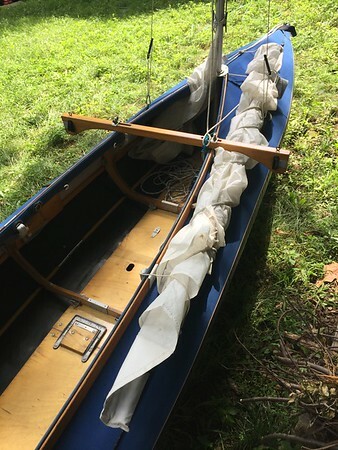 Or if you use a canoe paddle on one side of the boat only you could tie the boom, sail and yard on the other side? Just some ideas to get this started. So everything that was mounted up top was tucked somewhere in the front of the boat. I used metal shower curtain rings to hold the sail to the mast. I also tried a rig where the sail was held to the mast with a continuous line, if there was an advantage to that... it has escaped me. I believe the shower rings won out though, and I'm guessing it's because they were easier to get on and off. One thing that I really like about the BSD is that you can take the mast down easily and leave the lowest section (it's in four pieces) in the mast partner and simply drop the sail mounting 'rings' over the top of that mast section any you're done. The two piece Klepper mast makes this really hard to do... although it's still the easiest way to mount the sail. With the continuous line version I was able to pull the sail away from the mast with a lot of slackening. Then the sail could be tucked a little under the coaming and the rest laid along one side or the other inside the cockpit. 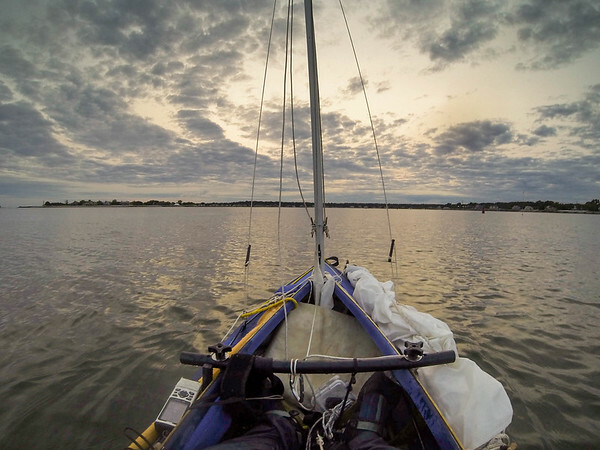 It's possible that I only did this for storage as I can't remember paddling with the sail tucked down onto my side... It was really quick to re-rig though. One thing I can recommend for either system is to attach a line to the gaff hook long enough to hang down to the cockpit. The gaff hook would miraculously come undone all the time while hoisting the sail out on the water. Never happened on land, but always happened on the water. With a line tied to the hook itself you could keep tension on the hook as it rode up the mast until the sail was tight enough to secure it. This was very handy when rigging out on the water. 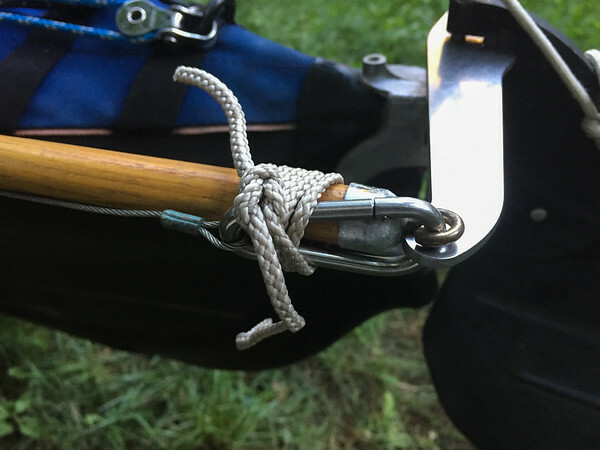 One thing I did with the BSD rig the other day that worked great was to drop the sail, crunch it all together, and then slide the carrying cover (bag) over the sail and boom and all the line, as far as it would go, then maybe made a knot around the mast holding it on. Then I swung the whole bag and sail forward onto the bow using a line running through the bow cleat and back to the cockpit to secure the 'package.' That actually worked really well in the MK1. Check the length, this might be something to try with the S2. Thank you for the reply's Robonaboat and Dlee . Dennis, The photos are superb! I will be rig up that way tomorrow. I was unable to access the video as it requested a google u tube account. If there is another link please let me know. I have watched your other video Sailing on Long Island Sound with the Strauss music many times. It is very inspiring. 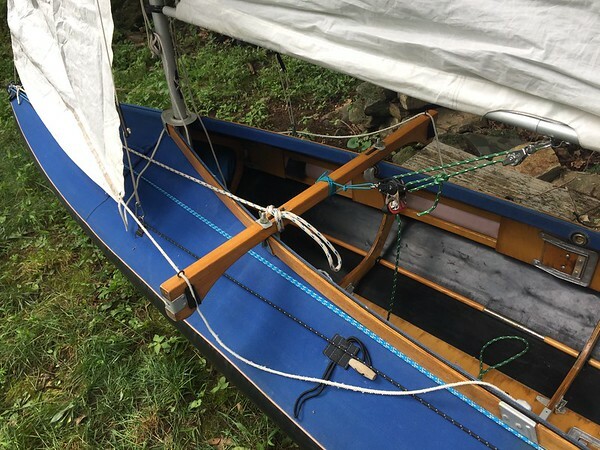 I use Balogh outriggers placed at the center with Klepper lee-boards placed near the mast, and Springcreek/Hobbie outriggers placed in back of the stern seat as I am not into swimming. I have the old style Balogh amas which are prone to disengage so the Hobbie's are my back up. According to JCWLX this setup should be good for wind gusts up to 35 mph. Treecutter, I had a problem with amas disengaging on my old style Balogh rig. The factory cord configuration resulted in all struts angling to outboard, common as far as I can tell. My wife and I own three Balogh rigs and all three were that way. The inboard loops would disengage from the strut. Upon seeing my rig, David Valverde commented that the outboard cords were too short. He provided new cord, which I installed. I tied and retied the figure 8 knots at the strut feet to come up with nearly equal tension. With longer outboard cords the inboard struts angle slightly inboard and the outboard struts angle slightly outboard. No amas have become disengaged since. Thanks for that tip. I'll check how mine are rigged. So far what I've done is attach a cord to the amas so that if they detach, they won't float away. I did the same before I installed longer outboard cord. I clipped a trigger snap to each inboard ama loop. A clove hitch was tied around the aka and the bitter ends tied to each trigger snap. This I did after pursuing an escaped starboard ama across a bay, catching it, and sailing to land on starboard tack. Treecutter, the video linked was the same one you watched... the Blue Danube on LI Sound... so you're not missing anything. Thanks for asking about this because it's inspired me to put the AII together and sail with the S2 rig again. I really like that setup. Just started putting the frame together tonight before it started looking like rain.... I'll let you know how it goes. We're going to Maine in a week and I need to decide which boat and sail(s) to take. I say sail(s) because the converted Kayaksailor is definitely coming along with either boat. 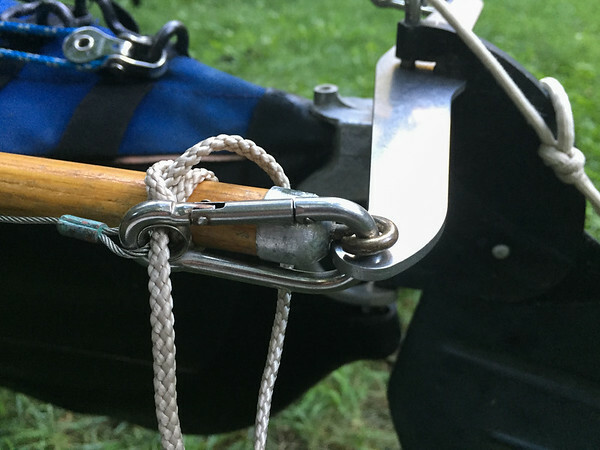 Seems like a taught line hitch might be good way to adjust the tension on those older aka setups... losing one side of an outrigger out on the water doesn't sound like any fun at all. So this totally worked for paddling and rigging on the water... calm water. This works Ok, not fabulous but definitely livable. One problem is that the line naturally seats and locks in the clamp. Not always what you want on a tender boat. I discovered today that snapping the line outward (line unkinking the garden hose) releases it when the angle isn't right for a normal release. Had winds from I'd guess 5-15 mph, didn't push my luck too much. Started with jib alone, then switched to main solo then added the jib back in. A little tender at first but I got into the groove after about 30 minutes. Really liked using this sail again. Love to look at it and it's just fun to sail. I really didn't feel like getting wet today so I let the main hang out a little looser than normal and it was great. I still got up on the gunnel several times, spent a lot of time kneeling and crouching on one knee and a little bit of time chillaxing at the back of the cockpit. With the leeboard at the third rib from the bow the boat seemed pretty neutral with a little bit of weather helm. I'll test this some more tomorrow hopefully. The boat sailed very true to the course I left it at which was good because I had a lot of other little problems that needed attention... most of them requiring me to face the stern. I really liked the simple setup on the controls. The jib sheets were a little bit of reach to adjust but not really a problem. Was a really great couple hours of sailing, one more on the lake and then hopefully out to Long Island Sound for some big water sailing adventure. Had a great time ghosting around the lake in zero to 3 mph winds yesterday. Very relaxing. No wind today so I fiddled in the yard and think I may have come up with a very simple tiller extension. I started with two connecting frame dowel pieces for an AII with the hook at one end. Squeezed the hook a little tighter and clipped it onto the rudder yoke cable carabiner. I wrapped it with line to hold the carabiner against the dowel. Now I just need to connect the dowels together so they don't come apart. Still searching for a good solution here. I think a drilled hole and some sort of through pin is necessary. I've been using the dowel for quite some time now but it keeps coming apart with all my non-invasive ideas. Anyway, these should demonstrate what I've come up with as a better mode of connection. BTW, if this works I'll eliminate the hand tiller at the back of the cockpit... hard to imagine that. The tiller handle reaches to the middle rib of the cockpit. In other news I thought I had a brilliant idea for a canoe type seat. 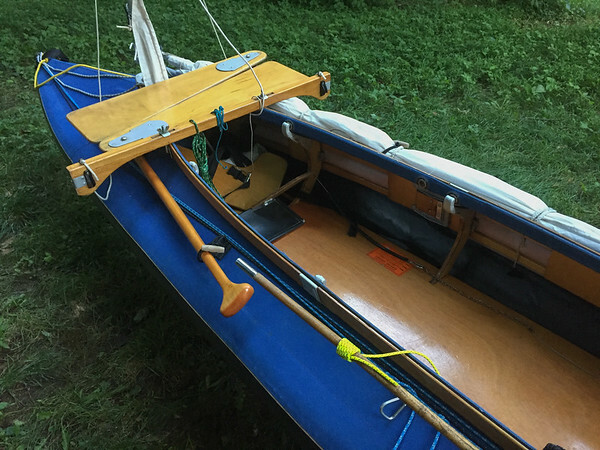 I mounted the Klepper sailing deck board on top of the frame gunnels (gunwales) inside the cockpit so the seat wouldn't be so high as it is sitting on top of the coaming. Unfortunately supporting the board out on the bitter ends made the center very soft and I constantly felt like the board would either break or slip off it's mount. It did hold me for quite a while though... So another attempt at a canoe height seat has failed. The hope for such a seat was to make the transition from sitting in the cockpit to getting on the hike out seats easier and smoother. Although this mount didn't work, it allowed me to determine that such a seat wouldn't work anyway. It's too awkward a move from the half sitting position in the cockpit up to the coaming. I think... it will actually be better to either sit on the board resting across the coaming and slide over to the hike out seats or simply raise up from kneeling to the hike out seats. Very hard to know what will work without a consistent and solid wind hitting the sail. I did remember to bring my floatation cushion out yesterday which made kneeling on the board much more comfortable. I don't think I got up on the hike out seats once, but I did spend a fair bit of time lounging at the back of the cockpit, ha. Do you have trouble holding on to the hand tiller sailing downwind with strong wind (15-20 kt) and following sea off the quarter? With my Folbots and BSD rig, as the waves push me I feel like I need to put a longer extension on the rudder yoke for greater mechanical advantage. Excellent question... I don't know. I have only been working this on a pretty calm lake so there really hasn't been any weather to test things like that. I do remember being out on Lake Champlain with following seas and twice having to climb out onto the stern deck to unlock my rudder from a jammed forward position... that was not fun. I guess my first thought in that situation would be to move to the foot peddles if possible and give no quarter. But yeah, a longer arm would probably be more advantageous on many levels. I'm sure it would be possible to find a metal shop to cut one... but if it flips inward and jams on the deck or something you'll be stuck until you unstick it. On the AII I had my tiller connected to the hand tiller at the back of the coaming before. So this is a new venture on this boat for me. I've always gone straight back to the rudder yoke on my MK1 and although that's never had an issue it's never sailed in heavy following seas. I sit in the cockpit and switch to foot control under those rough conditions. Were I sitting on the coaming with big wind and following seas, things might get s bit dicey. 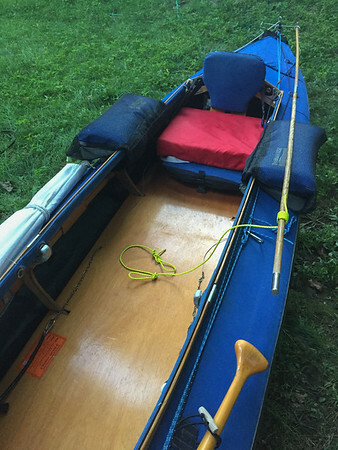 Back to the original thought in this thread, I love the option beamy folders give me to set and strike my entire sail rig when on the water. I have a BSD rig on a hard shell. Not only does that boat not have convenient space to store the parts, I'm sure I would go swimming in the attempt to install/remove akas. I think you would have trouble with a hand tiller in strong winds and quartering/following seas. I sure as heck have! And no amount of leverage on a standard rudder was enough for me. I found, in those conditions, that I needed to add my paddle, braced against the combing, to keep things right. And even then I got pretty exhausted after 30 minutes or so. I don't think the bite of the standard Klepper rudder can handle the power of a modern sail and big wind. Just my $.02. I, too, wonder about the stress on the rudder assembly with big wind and seas. So far the Folbot big D rudder has been up to it. I also wonder about the stresses from gusts bending the Balogh mast and submerging the ama, and steep waves (e.g. wake from a displacement hull boat) arriving abeam bending up the aka. I wonder when, after surfing down a wave, I bury the bow to the cockpit. Then again, managing these events is part of the fun of sailing a little boat not designed to do so. So far no catastrophe in rough conditions.